Lindsay is a well-rounded hairstylist that is talented in many areas of the Cosmetology field. She specializes in Haircutting and Coloring and is a Bridal Specialist. Lindsay brings ten years experience to Allure Salon and Spa. Lindsay is always able to create the most precision haircuts and is meticulous about balance, however, if you prefer a more carefree and edgy cut, she is amazing with that as well. 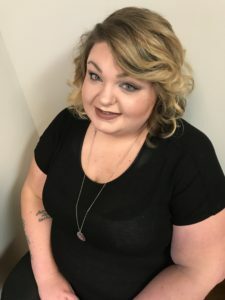 She is comfortable working with any type of hairstyle for men or women and is highly qualified and educated in many different color techniques. She loves to create individual looks. Her specialty is in Bridal Hair and Make Up. Lindsay was trained under Lancôme and Mac. She continually attends classes that give her inspiration and insight into the latest trends. Lindsay prides herself in knowing the latest products and trends and loves to share her knowledge. You can find her behind the chair most days creating amazing looks for her clients and educating them on how to care for their hair. Outside of the salon, she loves music, animals and of course shopping. On her days off you can find her chilling with her many pets or at a concert.